Astronomy is the oldest "Natural Science." Over the course of thousands of years, it has been acknowledged as "the engine," the driving force for human civilization and culture. Nostradamus, the astronomer and medical doctor, acknowledged that cosmic radiation opens channels reaching us inwardly and touching our soul/spirit during our time of sleep. When the soul (with the core of spirit) enters the region of origin her territory of eventful activities known to us as our "dream world," subconsciously experienced which is the open window allowing us a glimpse into our tomorrow. The cosmic order has been in turmoil since the year 2000, and should not be ignored in its true significance, according to Nostradamus. Our intrusion into space, man's unfamiliar territory, results in grave consequences for planet earth and humankind, Nostradamus already warned us 450 years ago. We witness almost daily the unleashed, severe, and devastating forces of Mother Nature by her ruling law of "what you sow — you will reap," her 'visible effect' as our punishment." December 21 – 23, 2012, was the cosmic shift, after 5,000 years the Mayan calendar coming to an end, and the "New Era of Aquarius," the predicted "Age of Enlightenment," began. 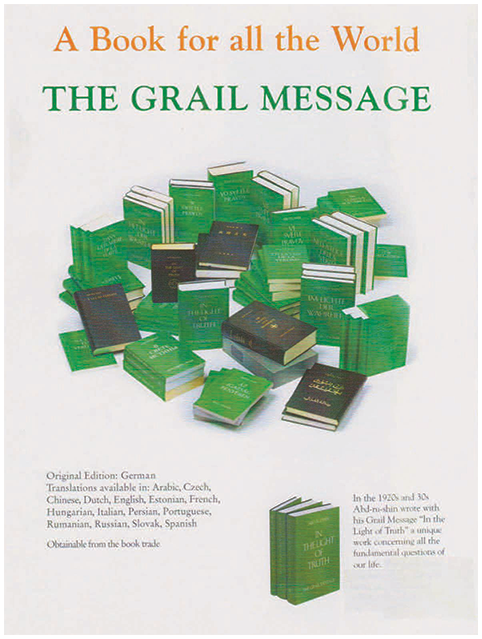 The predicted 'knowledge' required for the renewal of man comes from the Grail message in the classic book, "IN THE LIGHT OF TRUTH" by Abd-ru-shin. It is available in over 25 languages and in over 80 countries. 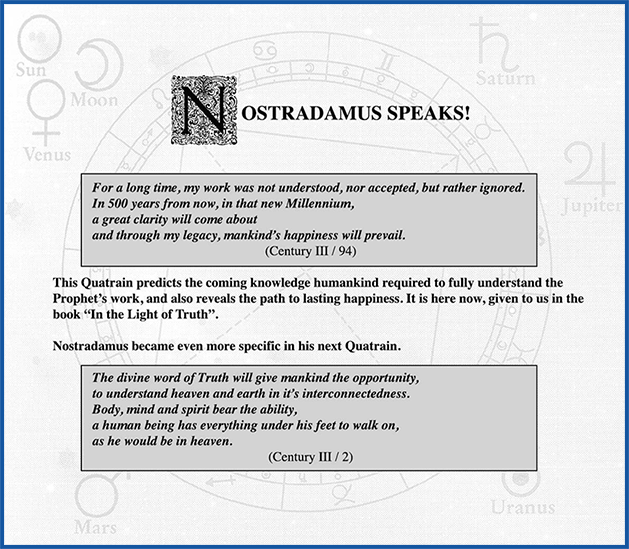 It leads humankind out of the present chaos and shows us our path in order to reach the "Golden 1000 Years" of peace and happiness as predicted by the great seer Nostradamus.